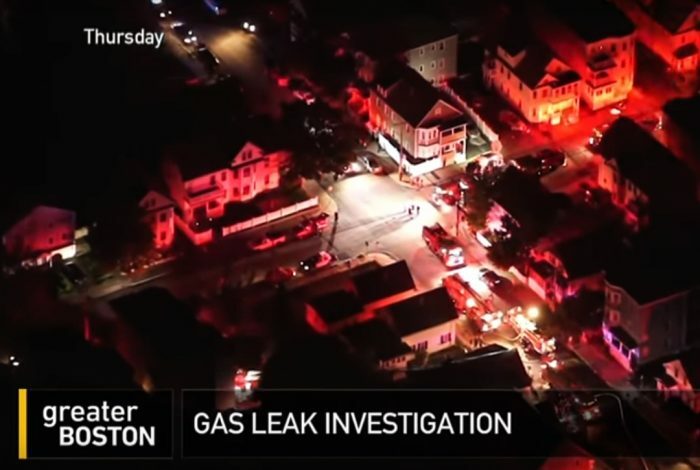 The recent gas line explosions and fires in Massachusetts triggered a state of emergency, and a federal investigation into the behavior of the company at the center of the chaos. But no one, especially the utility provider-at-fault, seems to have an answer for what — or perhaps even who — caused this vital service to fail so spectacularly. The news was certainly attention-grabbing — 70 explosions, fires, and gas leaks across three Boston suburbs within the space of an afternoon, leaving one dead, 30 injured, and 8,500 evacuated. The event hit the national evening news; and cable news services like Fox News and MSNBC halted their usual programming and covered the explosions. The utility company whose customers were affected, Columbia Gas, was clearly overwhelmed with the scope of the disaster. Massachusetts Gov. Charlie Baker (R) said the company seemed to disappear — shirking its responsibility to update the public on the situation through press conferences; this dereliction of duty caused fear, uncertainty, and doubt to grow. Even the emergency services had little clue as to what caused the disaster and what Columbia Gas was doing about it. As a result, Gov. Baker initiated a state of emergency, taking control away from Columbia Gas and handing it to a larger utility player, Eversource. Three long days later, there was an announcement from Robert Sumwalt, the chairman of the federally operated National Transportation Safety Board (NTSB) — an “over pressure situation” had caused the disaster. That was the “how” answered, but “the real question for this investigation is to answer why this occurred,” Sumwalt continued. He has said that the NTSB’s probe will concentrate on the company culture at Columbia Gas, and their policies with regard to these kinds of black swan events — highly improbable yet very disruptive situations. McDowell-Smith asserts that companies need to prepare for the worst, whatever that may be. She told WhoWhatWhy that confusion can reign when there is no one taking control. Her statement aimed to highlight the need for robust planning for these kinds of events. McDowell-Smith said that sabotage attacks on utilities are a reality — transformers in Silicon Valley were targeted by individuals working for the power company, itself, in 2013 — and referenced the well-documented 2016 election sabotage effort by Russian agents. She said that events like the gas explosions highlight the need for private companies to have disaster plans in place. Local, state, and federal services must also have their plans organized, “but it also comes down to the community,” and what she calls “preventative education” — initiating protocols, regulations, background checks, and security measures. “What are some of those key traits that individuals who are becoming radicalized display?” she asked. If regular people understand what to look for, there will be less chance of a colleague at the utility company or the train service being successful in creating terror events. And what of the thousands of residents disrupted by this energy grid disaster? Columbia Gas said it needs to replace about 48 miles of lines to restore gas to the 8,500 customers affected. This means cold showers and no real heating for some as fall begins to settle in. State Senator Mike Barrett is the co-chair of the joint committee on telecommunications, utilities, and energy. He pointed out that the area was now paying the price for being the first in the country to adopt gas street lighting, because 50 percent of gas pipes around Boston are more than 50 years old, and ratepayers are picking up the bill to replace them. President Trump promised to fix crumbling infrastructure much of the country relies upon every day — roads, bridges, and utilities — while campaigning. Will this event push him to make good on his pledge to implement “the biggest and boldest infrastructure investment in American history?” He has so far spent only one percent of his promised $1.5 trillion dollars. Meanwhile, Senator Barrett has a plan for Columbia Energy. Perhaps these fines can cover replacing all the old gas pipes in this historic area of the country. The video this week is an article from WGBH’s Greater Boston program; it highlights the plight of families affected by the gas leaks and fires in this economically depressed part of metro Boston. Related front page panorama photo credit: Adapted by WhoWhatWhy from Columbia Gas (Joanne C Sullivan / Flickr – CC BY-NC 2.0).